CPTV-Channel 24 in Hartford presented a Charles Ethan Porter segment on the CT Journal. The Society provided some of the information and material used in this show. The Vernon Historical Society Museum has one of the most extensive collections of information available on Rockville's noted Black Artist, Charles Ethan Porter (1847?-1923). Charles Ethan Porter was an African American painter born in 1847 or 1848 in Hartford, East Hartford or Rockville. Wherever his place of birth, in 1857 his father built a house in Rockville, and Charles graduated from high school here in 1865. Porter went on to study at New York's National Academy of Design, one of the country's most prestigious art schools. In 1878 he opened a studio in Hartford. Several years later, when he traveled to Europe, he took with him a letter of recommendation from Mark Twain. Upon returning to the U.S., Porter worked in Hartford and New York, returning to Rockville in 1889. Here he had studios in the Fitch Block and in a tower on Fox Hill. Toward the end of his life, his fortunes declined and he peddled his paintings door-to-door, trading them for food or flowers to paint. He died in Rockville in 1923 and is buried in Grove Hill Cemetery. 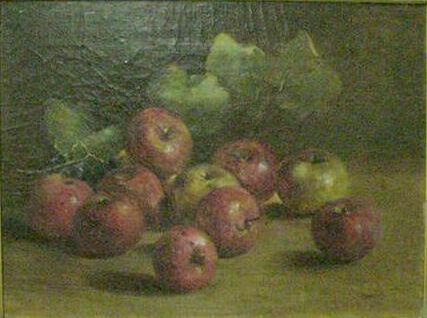 Although he died in poverty, Porter is remembered as the creator of minor masterpieces of American still-life painting. Among Mr. Porter's pupils was one destined to become far more famous than his master. He was Gustave Adolph Hoffman. The works of Gustave Hoffman are also on display at the Vernon Historical Society Museum. "Charles E. Porter, who resided at 23 Spruce Street near the top of Fox Hill, had a studio at the summit. Here Mr. Porter produced his still-life paintings and held his classes for pupils in drawing and painting. He had been trained in the methods of the Viennese School and hence turned out paintings of flowers and fruits in this dark, mysterious style. Porter was a tall, kindly gentle man who loved children and tolerated their comments and questions when they surrounded him as he set up his easel out-of-doors to paint the countryside from fields near his studio. His paintings, reasonable in price, easy to understand, and a delight to look upon, found a ready market among the homeowners of our town. They are today the treasured heirlooms of many a local family."